I’m so thankful for your sweet desire to follow Jesus, and take others with you. Your job is so important! As you lead your group through this study, here is the main truth that I hope you’ll keep circling back to: God is in control. Which means we don’t have to be. Oh, what freedom there is in knowing this to be true, and living as though you believe it. I hope the materials on this page will be helpful as you lead your women in these important discussions about God, control, and surrender. Please let me know if there’s something you need! I’d be happy to serve you in any way I can. 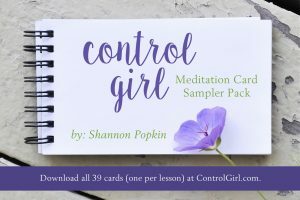 While my free, downloadable meditation cards are great for individual use, the Meditation Charts are designed for use during your group time. Each chart includes that chapter’s meditations, key verses, and prayers compiled into a handy one page document. You may print and distribute these charts however you like! Each of these 39 cards coordinates with a particular lesson from Control Girl. You can use the cards without the book and vice versa, but they compliment each other beautifully. Please let the women in your group that these cards are available for FREE download here. Also, I have compiled a “Sampler Pack” of my favorite meditations, taken from various lessons in the book. This set is available for purchase here. For more information, tips on using the cards, and links to each individual chapter’s cards, go here. Reflections on Surrender is our companion coloring book, filled with truth about control, ourselves, and God–messages that closely correlate with my new book, Control Girl. While you don’t have to work through the Bible study to enjoy the coloring book, the two compliment each other nicely! For more images and information, go here. The tools that Shannon provides – coloring book, [meditation] cards, leader’s guide – are effective supplements. Several group members reported this book “transformed” them! If you are looking for a remarkably challenging and life-changing book for a ladies ministry study, I highly recommend Control Girl. Shannon challenges the reader throughout the book to truly surrender to the One who is in control. I appreciate the author’s transparency and her willingness to speak to real life experiences that penetrate to the soul. I highly recommend using the meditation cards to carry with you as a daily reminder of God’s truth and promises. For information on group discounts (usually 45% for 15 or more copies) please contact my publisher, Kregel Publications. Call 800-733-2607 or email customerservice@kregel.com. Grand Rapids, MI groups, please contact Baker Book House near the East Beltline (616- 957-3110) or Kregel Parable in Grandville (616-531-7707). Join my Control Girl leader's list to receive resources to help you better serve your group.